1967 Toyota Corona - There's nothing really exciting or special about this 1967 Corona. I'm just posting it because it still exists. This car is in pretty good shape. The seller calls it "95% rust free". It needs some cosmetic work, along with some brake work, but virtually everything it needs (except for the paint job) could be done in your garage. Most of these cars have rusted away. Many of the survivors have been chopped, lowered and bagged, decked out in spoilers and body kits, painted gaudy colors, and generally modified and tortured in ways that no car should have to endure. This car is completely stock. Let's hope its next owner keeps it that way. Located in Washougal, WA, click here to see the eBay listing. 1967 Autobianchi Bianchina - Here's something you don't often see in the US: an Autobianchi Bianchina Berlina. Over the years I've seen a number of Trasformabiles and a few Cabriolets, but I can't recall ever seeing a Berlina. The Bianchina was based on Fiat 500 mechanicals. The 499cc, two-cylinder, air cooled engine put out 21 HP. This would be a cool alternative to a standard Fiat 500. Located in Newington, CT, click here to see the eBay listing. ** Sunday, March 20, 2011, 8:15 PM addendum - When I wrote about this Autobianchi I thought the price was $3500.00 It turns out that I missed a zero and it's $35,000.00. (It was late at night and I was tired.) More than a few readers sent me e-mails and posted comments regarding that. It's still a cool car, but a $35,000.00 car? Nah. 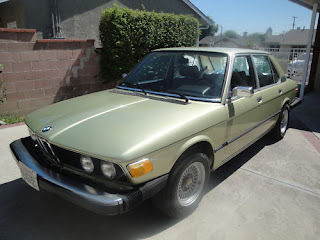 1978 BMW 530i - This is a really nice E12. The E12 was the first 5 Series. 1978 was the last year of the 530i. In 1979 it was replaced by the 528i. The E12 body was designed by Marcello Gandini. In European trim it's a timeless design. The US cars - like this one - look a bit dated because of the 5 MPH bumpers and awkward fender-mounted front turn signals. This is a beautiful E12. It has been repainted, but the seller says everything else is "100% original". Located in Granada Hills, CA, click here to see the eBay listing. $35,000 for that Bianchina is Laughable! I don't think a totally restored one is worth that much money. That Red Corona would be the Buy! Not too much work and you'd have a great car to take to shows even if it wasn't perfect, and you'd never see another one! The Autobianchi Bianchina is a neat car. The price is comical. It’s worth a small fraction of the asking price. I need to put a Corona on the list to buy at some point. I’ve never had one and at there seems to be a few decent ones out there at low prices. Love the E28 posted. This one look great in the metallic pea green. Metallic colors, like this from the 70’s have really grown on me lately. Looks like a well maintained clean car. Guys - I wrote that post late at night and I thought it said $3500.00. I literally laughed out loud at that price. There are fully restored Bianchina out there for much less. I had a 72 Autobianchi a112 a couple of years ago that I paid something like $3500 for on eBay. Real nice car. Clean, no rust and drove all over Chicago. Sold it a year later, back on eBay for a small profit. No not the same car, but you could have bought ten for the price of Bianchina on eBay. Yes, unfortunately, that Autobianchi is a case of an owner who sat a little too long on his "gold mine" and now it's worth more like $350! There are 67 listings in Ebay Italia selling Primeras, many in excellent condition for 3500 to 6000 Euros. WELL below the ridiculous $35,000 asking price for this one.